An alcoholic does not always have the physical capability or mental clarity to recognize their early signs of alcoholism, let alone put a stop to them. Some abusers will go to great lengths to mask their alcoholic tendencies. It falls on us to recognize the physical signs of alcoholism and the alcoholic behavior patterns they exhibit. Only then can we help someone get rid of this dangerous addiction. If you suspect you or your loved one are suffering from alcohol addiction, give us a call on (888)-459-5511, where our supportive experts will provide you with more information and treat your call with confidentiality. How to Tell if Someone has a Drinking Problem? Alcoholics see their next drink as the number one priority. An addicted person can not function without it; what is more, they are no longer in control of it, rather alcohol takes control over them. 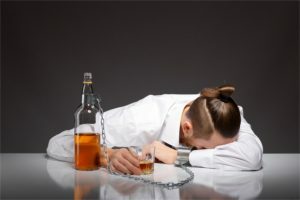 To prevent them from spiraling down into their addiction, one has to identify an alcoholic behavior as soon as possible. By doing this, they will minimize damage to both the physical and social aspects of one’s life. Having an occasional drink is a ritual of plenty social occasions. Drinking within limits, therefore, carries no particular harm and should not cause concerns. Yet, if taken a step further, drinking can become a dangerous habit and needs to be nipped in the bud. Certain signs and symptoms can help people determine if the person they know might be dealing with an alcohol dependency. 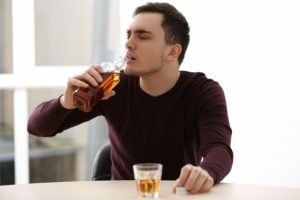 Apart from the behavioral patterns the person might acquire, there are physical signs of alcoholism which often help to spot an alcohol abuser straight away. A person who is facing an alcohol misuse problem will most of the times fit into the context of the ten warning signs of alcoholism. These symptoms range from physical to behavioral indicators which negatively affect one’s personal and professional life. The following list isn’t conclusive but can provide you with guidance in spotting an alcoholic. An inexplicable absence from work declined productivity, and neglect of household chores by an otherwise responsible individual are signs that the person probably does not have the physical energy or mental focus to perform his or her usual duties. This is not necessarily due to an alcohol misuse problem but is usually a good starting point for identifying one. Often, an individual will retain their drinking habits even in situations they are aware pose an increased danger to themselves and those around. Drinking while or before driving, for example, is one of such situations. Mixing alcohol with illicit drugs like cannabis and cocaine or prescription medicines are also situations which act as signs of alcohol abuse. Being cognizant of the dangers is an indication that the person is willing to take risks for the sake of pleasing their drinking habit. This abusive alcoholic behavior can be terrifying for those witnessing its manifestation. Alcohol abuser can have unexplained mood swings during the onset of withdrawal symptoms. Sudden and unexplained mood swings in an even-tempered person or someone who does not suffer from mood disorders may indicate the early phase of alcoholism. If a person exhibits alcohol withdrawal symptoms, it is likely that he or she has been drinking for quite some time. This indicates that the person is aware of his or her drinking habits being problematic or abnormal but is trying to mask them or play them down. This is one of the most reliable signs of alcohol addiction. This is a telltale sign of chronic alcohol abuse or full-blown alcohol addiction. The person not only drinks more but also shows the symptoms of resistance to alcohol when compared to his or her friends. Their body has become used to having a high concentration of alcohol in the blood. These will be more tangible conditions such as those listed above. An addict is also less likely to care about their appearance with a flushed-looking face, trembling hands, and red or blotchy skin being the typical physical signs of alcoholism. Reduced attention to their partners, secretive behavior or dishonesty, and concerns over finances take a toll on relationships. If a person is unable to quit alcohol for the sake of restoring harmony in a romantic relationship, it is evident that he or she values alcohol more than their partner. Alcoholic behavior in relationships is a good method to spot a way of alcoholic thinking. If frequent clashes with the law on charges of driving, disorderly conduct, or violent behavior in a drunken state cannot keep a person away from alcohol, what can? Such attitude firmly he or she prioritizes alcohol over life, safety, and acceptable social behavior. Once a person is controlled by alcohol their decision-making abilities become clouded, too. Commonly present among the youth who begin to experiment with alcohol, binge drinking is a gateway to addiction. It is also one of the early signs of alcoholism. Because of strong, devastating properties of the episodes, one can quickly notice a person is indulging in such activities too often. Binge drinking is a problematic drinking behavior. Alcohol withdrawal symptoms are double trouble. They don’t only bring heavy discomfort to an affected individual; they also prompt them to drink more to alleviate the adverse symptoms. Even if a person wants to quit, the pain might be unbearable, and they find temporary salvation in their next drink. In the case of many alcoholics, these symptoms start to manifest within 24 hours of having the last drink. Therefore, those affected by a more serious addiction tend to drink in unusual intervals. Mornings or afternoons are some of these atypical times. Not all of the above-mentioned alcoholism signs may show up together. In fact, some might never manifest at all. So if you notice someone who is exhibiting abnormal drinking behavior which is consistently landing him or her in trouble, advise them to seek professional help. When these signs show up, it is an index that alcohol has already started to affect the body and the mind of the individual. For more information on the treatment process and procedures in place for those who suffer from an alcohol addiction, call our specialist team on 888-459-5511. We treat every call with maximum confidentiality and support. Spotting an alcoholic is one thing, but extending a helping hand is the step that takes audacity. Confronting someone about an alcohol problem can be a daunting task, especially if the alcoholic is in denial about of their addiction. In such a dilemma, it is important to think about the difference you will have made to someone’s life. It could be a life-saving decision. One is encouraged to approach the individual gently and use encouraging words to make them feel at ease, letting them know they are not alone in this struggle. There are facilities in place that will effectively target any alcohol addiction. 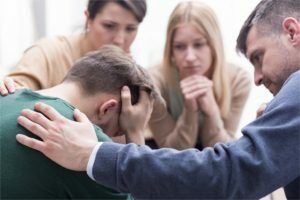 Staging an intervention is another viable solution that may require a few caring individuals who are close to the person dealing with an alcohol use disorder. If you have spotted yourself or your loved one displaying some of the warning signs of alcoholism, give us a call on (888)-459-5511. Our knowledgeable team is here to support you and provide you with more information.